FURminator’s trusted line of high-quality grooming combs provides a gentle, effective solution for finishing the grooming process. All dogs require grooming, no matter the coat type: thick, curly, fine, silky, straight, or somewhere in between. 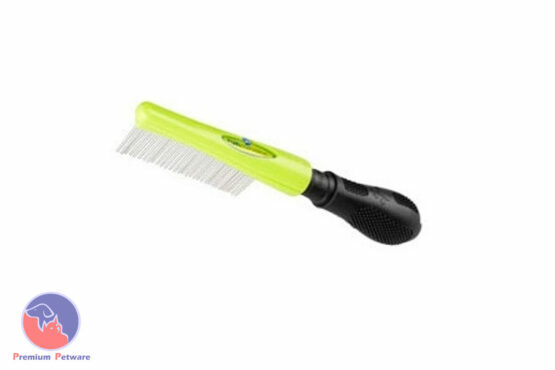 FURminator’s superior grooming brush line includes slicker brushes in two sizes, each available with firm or soft pins, as well as a dual brush featuring a pin side and a natural bristle side. No matter the specific tool, FURminator’s advanced line of brushes is the most trusted solution for keeping coats clean and healthy and keeping pets and their owners comfortable and happy. Brushing is the first step in the FURminator grooming process, followed by combing. Combing a pet’s coat extracts any debris left over from brushing and removes small surface mats and tangles with minimal tugging, keeping fur clean and healthy. Beware of cheap imitation FURminator products. Our FURminators are guaranteed to be genuine and are covered by manufacturer warranty.